- Precision machined aluminum base for planing accuracy. - Powerful motor in compact and lightweight body. Compact and lightweight for easier transport. - 4-post design and diagonal cross supports for stability. 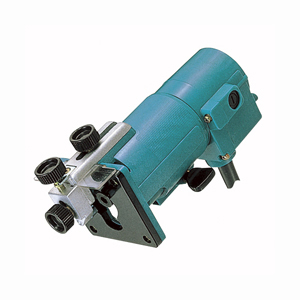 Collet capacity 12 mm or 1/2"
Fine power-to-weight ratio in this well-balanced router. - Non-marring base for excellent finish. making holes for electric outlets. - Ergonomically designed slim motor housing for superior handling. - Rubberized soft grip provides comfort and control. - Transparent plastic base for clear view of trimming edge. Capacity Collet : 6mm or 1/4""